We had nine people and made 8 or 9 containers to sell. It was a great group and we have a new member who will join us in the fall. As many of you know, we have scheduled a Fall Plant Sale in conjunction with the Tinker Nature Park Fall Festival in September. We plan to sell mums, flowering kale, asters and other perennials. Another idea that was presented was to sell hypertufa planters, which can be made inexpensively and sold for a nice profit. Many of you have participated in hypertufa workshops in the past and we'd like to do another one with the idea of making additional planters to sell. So, on Thursday, June 7th at 6PM, we will meet at Carol's barn. Carol's husband has a cement mixer, so we won't have to go through that process individually - yeah! This can be a messy project, so dress accordingly - another good use for gardening clothes! Please remember that the only way we can present interesting speakers such as Betty Green (pressed flowers) and Laurie Burtner (perennials), etc. is by making money at our fund raising events. Hypertufa planters sell very well and since they are inexpensive and fun to make, it's a win-win deal! This October a group of us met 1st at Tinker and then at Carol's house to create Hypertufa "stuff". Click below to see what we created. Hypertufa Workshop - Saturday August 16 & 17 from 6PM to 8PM at the barns at Tinker Nature Center on Calkins Road. 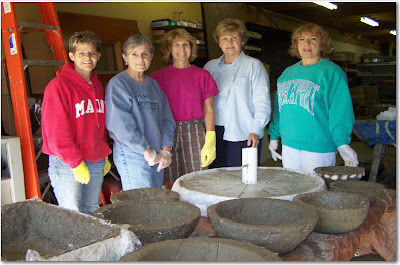 Master Gardener Laurie Burtner has volunteered to do a hypertufa workshop for our group. Members would pay only for materials - just a few dollars. We would need to meet for about 2.5 hours and then again for about an hour the next day. Here is a list of the items that you would need to collect - some could be shared. We would need to purchase the product to make the mix, so an accurate count is necessary. There are also pictures below of a planter and a mill wheel that Laurie has made.